Although the New Order is unbelievably famous and the Code is spoken of throughout highsec, some miners are so disconnected from the EVE community that they haven't yet heard of us. That keeps things fresh for our Code enforcers. Miners react with a wide range of emotions when they first hear about the Code. The best of them respond with enthusiasm and compliance. The most bot-aspirant of the carebears are horrified. spookytj's bio was a monument to the futility of bot-aspirancy. 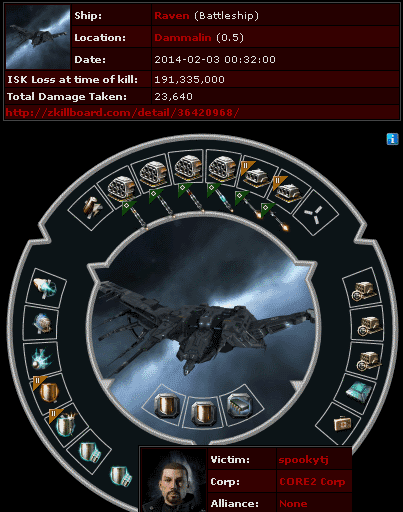 It expressed the belief that highsec mining was the way to further the pilot's true goals in EVE. 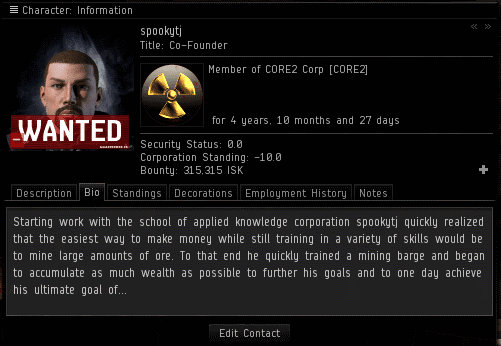 This optimism was belied by the fact that spookytj had been in the same corp for nearly five years. That's a lot of highsec mining. And I'm pretty sure his more ambitious goals, if indeed he ever had any, had long since been abandoned. spookytj was a living tragedy. Alyth did what any Agent would do under these circumstances: He began bumping the miner. spookytj refused to pay, and was cheered on by a fellow rebel named DeadDemi. Despite his advanced age, spookytj was as quick with the Miner Bingo quotes as a newborn. He didn't think the bumping would do anything to him. The New Order believes in lifelong learning. Alyth had so much to teach him! As Alyth cracked open the bumping lesson plan, DeadDemi appeared in the belt with a Deimos. Alyth was unintimidated by the Carebear Stare. spookytj spiced up his Miner Bingo clichés with some threats. But this wasn't Alyth's first rodeo. He had the situation well in hand. 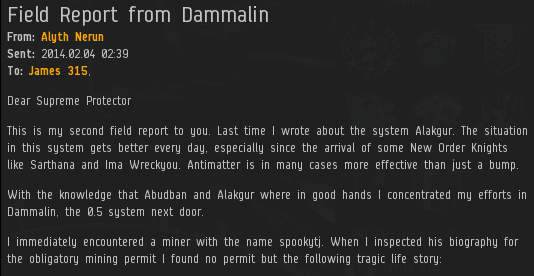 DeadDemi didn't want to have a dead Deimos, so instead of CONCORDing himself, he purchased an available kill right on Alyth--for three hundred million isk. I always thought people who offered kill rights on us for exorbitant fees were foolish, but apparently one of those guys is now 300 million isk richer. Having realized that bumpers can, in fact, stop miners from mining, spookytj retreated from the belt and returned in a Raven. spookytj initiated the carebear ritual of yellowboxing our hero's Stabber. 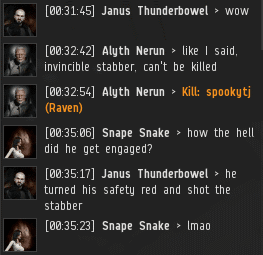 Local citizen Janus Thunderbowel cheered spookytj on, encouraging the miner to perform a suicide gank with the Raven. The compassionate Alyth tried to make spookytj see reason. Would he succeed, or would carebear blood need to be spilled today? Carebear blood it is, then. spookytj's suicide gank Raven tried mightily to tank CONCORD, but it was no use. His attempt on Alyth's life failed, and he was 190 million isk poorer for it. Resistance is madness. The slain rebel's pod retreated to a station in ignominy. Alyth's triumph deeply impressed the indigenous population of Dammalin. But Agents like Alyth don't do this job for fame and social status, though they get that, too. Alyth was more concerned about spookytj's well-being. Had he seen the error of his ways? Or would another lesson be needed? So 300M for a killright (lol) + 190M for a suicide Raven = 49 years worth of mining permits up in smoke. I'm sure one of our noble knights will remind him about kill rights in the near future when he's in a blingy mining vessel as well. Shoulda bought a permit. Stories like this make me proud to be a New Order shareholder. You just can't make this stuff up. I love it when people spread this myth that "orbit" somehow counters bumping. Moving only counters bumpers that use "Approach", anyone who manually flies will bump you anyway. iam miner and tested it. NO BUMP possible while orbiting. Maybe your bumber was bad? Orbiting works better in theory than practice. If your orbit hangs you on another roid - and it will if it can find a way - then you are much worse off because now you can't align to anything and have trapped yourself. You know what works really really well to stop bumping? Buying a permit, being at your keyboard, complying with the code, and appreciating all th hard work James and the NO agents put into making this game a better place for us all. It's a lot cheaper too. Alyth is lying when he says that abudban is compliant. I passed through the system on an alt last night and only saw a few permit holders out of nearly 78 miner pilots and there was no agents policing the asteroids. It appears that the knights were sleeping on the job. Regrettable. So it looks like it may be a good idea to get a kill right on bumper characters and then sell it for an exorbitant fee. Just shoot your alt and post the KR for 500m, this post proves some carebears may actually pay for the KR if they get angry enough. LMAO this website is HILLARIOUS you guys are so stupid for thinking you actually have some control in eve over anything other than your own characters (even funnier that it happens to be mining you want to control). Clearly you are to scared to mess with someone who will fight back that's why you bump miners. You guys are worse than any bot has ever been. Looking at your past alliance war history makes me laugh. Hide much? Expect to get screwed real soon.